There has been a distinct lack of posts on Penfold's South East Asian Odyssey in the last couple of weeks....this hiatus was caused by my girlfriend and I being in Fiji. I am now stuck in Los Angeles due to volcanic activity in Iceland.....and I don't mean the crappy supermarket chain in the UK!!!! 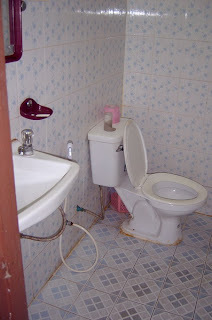 Most hotels, restaurants and other establishments in Thailand, that cater for foreign guests, will have a good old-fashioned, Western-style, "sit-down" toilet. What makes the experience of taking a dump, even more pleasurable, is that most of their toilet facilties will have a toilet hose, more commonly known as the "bum gun" or "jacksie jet", which in my humble opinion is the greatest Thai invention of all-time!!! It serves the same purpose, as a bidet in a European bathroom, and an example can be seen in the photo below!!! 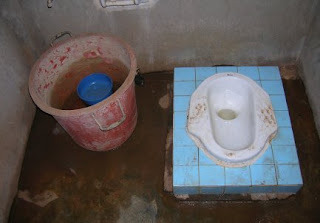 But, if you're ever caught short in the Land of Smiles and you're staying outside the main tourist areas, or with a rural Thai family, then you may be faced with the dreaded "squat pan".......not quite so salubrious, eh!!! At first glance it seems simple enough to use 1) pull your pants down 2) squat and do the business 3) clean up . Well, if you've never used one of these traditional toilets then parts 2 and 3 might be a little bit difficult to grasp. For me, because I'm not quite as agile as most Thais and have the balancing skills of a one-legged drunk, the squatting part can prove a little tricky!!! I must also warn you that it's imperative to pull your pants down and in a foward motion or you may end up with an unwanted deposit in your undies!!!! The cleaning up process can also prove somewhat problematic, because, as you can see from the photo, there is no toilet paper or flush mechanism!!!! The bucket of water next to the pan has a small bowl floating in it and this serves two purposes. Firstly, to clean your backside, which can be achieved by filling the bowl and gently splashing. Secondly, to flush away any incriminating evidence, to do this you fill the bowl and pour it in to the toilet pan, nature and gravity will do the rest!!!! Thais are adept at using these facilties and you never see them with wet patches on their trousers or water trickling down their legs after a visit to the "hong nam". Unlike most Westerners, who come out looking like they have just entered a wet t-shirt contest!!! The facilities themselves are not the only thing that will make your blood run cold. You will soon find out that Thai toilets are home to more wildlife than the Amazon rainforest. It is not unusual to find mosquitos, flies, lizards, frogs, snakes and did I mention the arachnids!!!! There's nothing quite like having flies buzzing around your spinchter or a venomus spider within inches of your meat and two veg, while taking your morning constitutional!! !